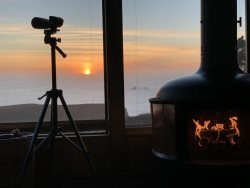 Tidesong vacation rental in Jenner Ca sleeps 4-6. Very Private, great views, private hot tub, walk to major north coast beaches. "Love love loved this place. A perfect getaway for our family. Well equipped and views to die for." "We had a nice weekend at Tidesong. The location is great, and you can see the ocean from the top-floor bedroom. We loved using the wood-burning fireplace, well-stocked kitchen and hot tub. The beds were comfortable and the linens were soft. The house is a bit rustic in that we killed quite a few bugs that found their way in from the outside. The wifi is quite slow, but you shouldn't come to a place like this just to look at the internet." "We had the best time at this house. Loved the view of the river and Jenner. A few steps and the ocean view is magnificent too. The house has everything you need to relax. The neighborhood is very quiet and in a few minutes drive you are in Jenner. We went wine tasting, hiking and out for dinner. I really like this place." Tidesong is situated on one and a half acres and offers views to the ocean past the river mouth and charming views across the river to the village nestled in the hillside of Jenner by the Sea and below the dramatic headlands rising over 1,000 feet from the river valley, crowned with coastal forests. The main level offers a great open room with living room, dining room, a well equipped kitchen and wood burning stove for fire/ambiance. Wrap around deck with BBQ and Hot Tub seating. Satellite TV and Internet. A main level bedroom with a queen size bed, opens to stairway to the upper loft bedroom with king size bed, and private bath. There is no door from the upper loft bedroom downstairs to the queen bedroom.